“Be BIG!” my high school speech coach used to say to me as I practiced my dramatic interpretation pieces for competition. He’d encourage me to take a wider stance, project my naturally quiet voice, and stand up straight. Those were great tips for delivering a more convincing and engaging speech, but I think what he was really trying to teach me all those years ago was to have confidence in myself and to own my own power. Being BIG, taking up space, and being seen can be very vulnerable and scary. When I first started intuitive painting, I only painted on single sheets of paper. Until one day, I saw an image emerge above my sheet of paper and I needed to add another page to paint it. 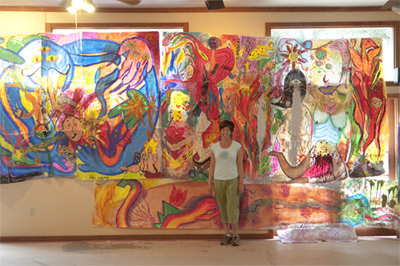 Over the course of several months, the painting grew to three sheets, then six, and ultimately to 18 sheets to create a wall-sized, crazy painting. Each time I realized that the painting needed more space, I would call my painting teacher Chris over and I’d then proceed to whine, pout, or stall… whatever I could do to resist letting the painting get bigger because it made me very uncomfortable. I felt bad if other students in the studio had to move their stations because my painting was too big, I felt like a burden if I had to ask other people to help me add more paper or pin this unwieldy monstrosity to the wall, and I felt like I was being super obnoxious for having a painting that was so in-your-face ginormous (like, um who does she think she is?!). And mostly, I was shocked that I had so much bigness in me. But to see it spread out in front of me in bright, bold colors, I couldn’t hide from it. Obviously this was my learning edge because every intuitive painting I’ve done since then has been huge. 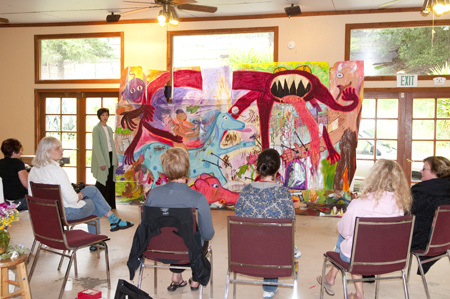 In fact, now it is part of my process to paint big. I love the feeling of being in front of a wall and moving my paint brush all the way across it, adding in color and shapes with abandon, and letting my whole body get into the experience. I get to stretch myself literally and figuratively. It’s freeing, wildly expressive, and oh-so satisfying. I even realized that I love that feeling of standing up and moving things around a big wall so much that now I do my planning that way. In my office I have an entire wall dedicated to a huge calendar. I stand in front of it and write my goals and to-dos on sticky notes and it helps me connect with my big vision. Let the big theme remind you that when you allow yourself to be big and take up space you’re honoring all of who you really are! Jennifer Lee, the founder of Artizen Coaching and author of The Right-Brain Business Plan, spent a decade climbing the corporate ladder before pursuing her creative dreams. Through her courses, coaching, products, and writing, she empowers others to follow their passions. This is so inspiring…especially love how you describe the feeling of taking up TOO much space..being TOO big. A hard thing to work thru..but – clearly – you have!!! I have a 6 ft roll of canvas that I’ve had for, oh, 8 years. I have lots of excuses for never having rolled it out (well, I cut a 14 x 16 piece out of one corner for an intuitive painting when I first bought it). I’m thinking I need to make a triangle or something odd to pull me in – all that canvas just sitting there. Thanks for this post! It reminded me of the canvas and set off something in the background creative area. We’ll see what happens! BTW I absolutely LOVE the energy in these! I love seeing these BIG paintings! Stephanie, you are awesome and I really enjoyed hearing about how your process began. I love that for the first time in years I’m trying to get “bigger” instead of smaller.